If anyone I know has the most bulky wallet ever, it is my dad. Ever since I can remember, he has had a huge wallet packed full of cards and papers that he keeps in his back pocket 24/7. All of his pants have a "wallet bulge", even when he does take the wallet out -- the pants are stretched out from him having such a large wallet! If this sounds like you or any man in your life, it's time to get an All-Ett billfold - the world's thinnest wallet! The All-Ett design removes all of the unnecessary material build-up found in so many average wallets and keeps things flat and organized rather than separating each card/paper with layers of fabric. 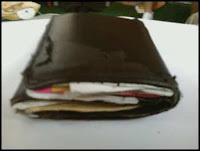 Having a thinner wallet can help relieve back pain and is chiropractor recommended. I decided to do an experiment with my dad's wallet to see if we could fit everything from his bulky wallet in the All-Ett billfold. Not only did we fit everything into the All-Ett wallet, but there was even room leftover, and the All-Ett was about 1/3 of the thickness as his original bulky wallet with the same amount of items! 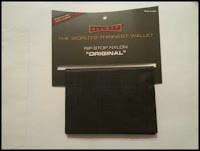 The Original All-Ett wallet that we used for this review holds up to 30 cards, cash, business cards, and more. It is made of Rip-Stop Nylon which is a strong, yet extremely thing and light nylon material. All of the All-Ett billfold designs are also available in other colors and available with Genuine Leather exteriors too, it just costs a little more. 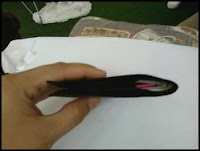 I am very impressed with how thin the wallet is and how much it holds without looking like it has much inside of it! My dad couldn't believe it and threw his old bulky wallet away because he now has the world's thinnest wallet! Buy It: You can purchase All-Ett billfolds online. The Original All-Ett is $19.95. Win It: Enter here to win the Original World's Thinnest Wallet! Disclaimer: I was given an All-Ett wallet free of charge for the purpose of this review. All opinions are my own experiences with the product. Individual results may vary. No other compensation was given. would love this for my hubby! I follow via gfc! peytonsmomie at hotmail dot com. I follow you on twitter 1 Danni_LJD peytonsmomie at hotmail dot com. I follow via twitter 2 Danni_LJD peytonsmomie at hotmail dot com. I follow C4l through google. I like C4L on Fbook. I am subscribed to C4L through email also. I entered the Little In the Middle Jeans giveaway.